Abraham Pollin (December 3, 1923 – November 24, 2009) was the owner of a number of professional sports teams including the Washington Capitals in the National Hockey League (NHL), the Washington Mystics in the Women's National Basketball Association (WNBA), and the Washington Wizards in the National Basketball Association (NBA). Pollin was the longest-tenured owner of an NBA team, holding the Packers/Zephyrs/Bullets/Wizards franchise for 46 years. Pollin was born to a Jewish family in Philadelphia on December 3, 1923, to Jennie and Morris Pollin. When he was 8, Pollin's family moved to the Washington area from Philadelphia. Pollin graduated from The George Washington University in 1945 and took a job with his family's construction company for 12 years. The Pollins launched their own construction company in 1957. A successful construction contractor in the Washington area, Pollin headed an investment group that bought the then Baltimore Bullets in 1964. He moved the team to the Washington area in 1973 after building the Capital Centre. In 1996, Pollin announced that he was changing the team's name because he felt the name "Bullets" had too many negative connotations. "Our slogan used to be 'Faster than a speeding bullet,' but that is no longer appropriate", Pollin told the press. A "Name the Team" contest yielded the name "Wizards." Pollin supported the Washington, D.C. community philanthropically, including a 1988 partnership with businessman Melvin Cohen to award college scholarships to 59 fifth-graders in Seat Pleasant, Maryland. Beginning in 2002, an award called "The Pollin Award" has been awarded annually in his honor. People are chosen for the Pollin Award based on their dedication to the Washington, D.C. community and the impact they have on it. Winners of the award have included Georgia M. Dickens, 2002 Executive Director, The S.T.E.P.U.P. Foundation Of Greater Washington, D.C. Inc., Harvey C. Barnum, Jr., 2005 Teacher of the Year, Jason Kamras and 2006 Miss District of Columbia, Kate Michael. Pollin died on November 24, 2009, nine days before his 86th birthday, of corticobasal degeneration, a rare brain disease. He had made donations totaling $3 million toward finding a cure for the disease. Pollin and his wife, Irene Sue (née Kerchek) were married on May 27, 1945, in Washington, D.C. The couple had four children, three sons and one daughter: Linda Joy (1947-1963), Robert N. (born 1950), Kenneth Jay (1952-1954), and James Edward (born 1958). Linda and Jay both suffered from congenital heart disease, leading to Jay's death at the age of 14 months old and Linda's death at the age of 16. After Linda's death, her father was so distraught that he quit his construction business and took a year off of work to recuperate from the loss. Abe Pollin was the chairman of the board, chief executive, and the majority shareholder of his company, Washington Sports and Entertainment, which owns the Wizards and the Verizon Center, amongst other entertainment interests. He was also the builder and owner of the Capital Centre, former home of the Washington Bullets (Now Wizards) and Capitals. Mayor Adrian Fenty named December 3, 2007, "Abe Pollin Day" in Washington, D.C.
^ a b "Pollin-Kerchek Nuptials Read In City Hotel". The Washington Post. June 14, 1945. p. 10. 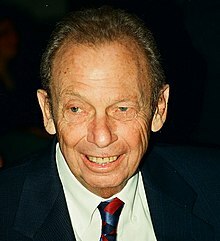 ^ a b c d e f g h i "Washington Wizards owner Abe Pollin dies at 85". November 24, 2009. Archived from the original on February 13, 2010. Retrieved November 25, 2009. ^ "Washington Wizards Owners Irene & Abe Pollin". National Basketball Association. ^ Schwartzman, Paul (December 20, 2011). "The Promise: Two wealthy men set out to transform the lives of 59 fifth-graders". The Washington Post. ^ "Funeral for Wizards owner Pollin to be held Friday". ESPN. Associated Press. November 25, 2009. Archived from the original on April 19, 2014. Retrieved November 28, 2009. ^ "Mesler inducted into Jewish shrine". The Buffalo News. March 27, 2011. Archived from the original on March 12, 2012. Retrieved March 28, 2011. ^ Steinberg, Dan (December 3, 2007). "Today is Abe Pollin Day". The Washington Post.